Small retailers in England could face an uphill struggle to cope with dramatic increases in business rates, a business organisation has said. More than 1.5 million companies are set to receive their business rate bills in the next few days. But the Federation of Small Businesses (FSB) is warning that all companies will face sharp rises this year, with an average increase of 15.7%. 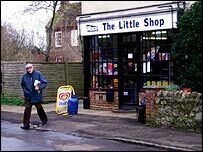 It says shop owners in the south-east of England will be hardest hit. Business rates are the second or third highest item of expenditure for most small firms. Rateable valuations take place every five or six years. Currently rates are five times more expensive as a proportion of turnover than they are for large companies, according to the FSB. "The odds are already stacking up against small shops and we are concerned that some independent retailers will find it impossible to absorb these additional costs," said FSB business rates chairman Roger Culcheth. The recent revaluation of business premises by local authorities has led to a huge increase in the rateable value of shops, particularly in wealthy areas. The rateable value is based on the going rate for a particular area, irrespective of whether the business is doing well or making a profit. Calculated by the Valuation Office Agency (VOA), part of the Inland Revenue, the rateable value broadly represents the yearly rent the property could have been let for on the open market on a particular date. On the plus side, small firms with a rateable values of £5,000 or less can apply for rates relief - a 50% discount on their business rates. The relief decreases on a sliding scale for rateable values of between £5,000 and £10,000. However, many smaller shops in affluent parts of England fall above the £10,000 protection threshold and will struggle to pay the bill in whole, the FSB says. The organisation cites as an example a toy shop in Winton, Bournemouth which has a rateable value of £11,500 and cannot benefit from small business rates relief. As a result its rates bill is £4,800 a year. However, a similar shop, one mile down the road, does benefit from rates relief and will pay £900 a year. "Small business rates relief should be extended to all business premises with a rateable value of less than £25,000," said the FSB's Roger Culcheth. Tony Nixon is co-owner of the Burford Motor Company, a small car showroom in Bournemouth. He told the BBC that the rise in council tax was dwarfed by how much his business rates had shot up. "Last year they were £4,373, this year they will have gone up to £7,055," said Mr Nixon. "I cannot understand on what basis they have done this."